Just last month, the UCLA Center for the Study of Inequality and the Asian Pacific American Institute for Congressional Studies issued a report projecting that the size of the Asian American electorate will double to 12.2 million in 2040.This growth of the Asian American electorate outpaces that of the overall growth of the Asian American population, the latter of which is projected to grow by 74% by 2040 to 35.7 million—already the fastest growing racial group in the country. 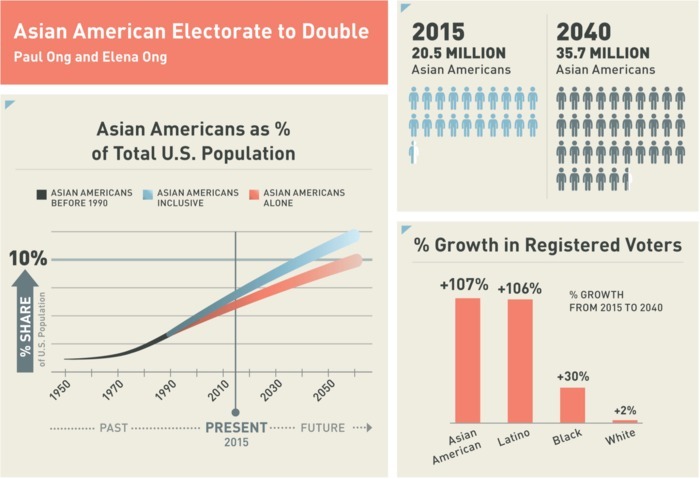 In growing from 4% of the total electorate to 7% of the electorate by 2040, the Asian American vote will increasingly play a significant role in elections. The growth of the Asian American electorate is in part due to increasing numbers of American-born Asian Americans, already with citizenship and eligible to vote when they become of age. The UCLA and APAICS study predicts a 160% increase in American-born Asian American registered voters, which is approximately twice the growth of foreign-born naturalized voters. This projected growth underscores the importance of the Asian American vote in states and districts across the United States, as well as the need for both campaigns and media to pay attention to the Asian American electorate. Today, the fastest growing Asian American populations are in Nevada, Arizona, North Dakota, North Carolina, and Georgia. These states have seen Asian American populations more than double since 2000. Yet we know from the 2012 post-election survey that the plurality of the Asian American electorate, at 47%, does not identify with either the Republican or the Democratic Party. Despite this significant political nonidentification, the same post-election survey in 2012 found limited contact between political parties or campaigns with Asian American voters. Thus there is still much work to be done in terms of voter outreach, education, turnout, and even voter registration. These projections are promising, but require us to continue doing the aforementioned work to ensure that these projections are a reality.